Even as the LGBT community enjoys huge gains in understanding and acceptance. Even as we have key leaders from every sector and across every spectrum supporting our full equality and rejecting rank bigotry. Even as we seem closer than ever to winning the freedom to marry nationwide, a persistent and longstanding threat has reemerged. You have likely heard or read a chorus of anti-LGBT voices in the last few weeks supporting so-called “conversion therapy,” the vile practice used by some unethical counselors and therapists to try to change someone’s sexual orientation or gender identity. For more than 20 years, NCLR has diligently worked to end conversion therapy, especially for LGBT youth. We know the practice—which often includes the use of shame and verbal abuse—does untold damage. We know it is dangerous and wholly discredited. We know sexual orientation and gender identity cannot and should not be changed. We are committed once and for all to ending conversion therapy, ensuring that every LGBT person knows they were born perfect. But recent statements by the Texas GOP and others over the past few weeks make clear that the vocal minority of anti-LGBT advocates who profit from this destructive practice will not go quietly. These statements are not just random comments or events. This is a coordinated effort to reassert the legitimacy of this fully discredited practice and to resurrect the fraud that sexual orientation or gender identity can be changed. Conversion therapy’s vicious assault on human dignity is on the ropes—but it is essential that we finish the job. Over the last two years, NCLR has played a pivotal role in passing and successfully defending laws protecting LGBT children from these practices in California and New Jersey. State legislators and policymakers across the country have seen the damage this quackery inflicts on young people and taken action to stop it. We are now working closely with legislators and state leaders in several states to pass laws similar to those in California and New Jersey. To support our multi-pronged effort to end conversion therapy in the next five years, we have launched #BornPerfect: The Campaign to End Conversion Therapy. We have seen firsthand the damage done by this dehumanizing and shaming practice. We’ve heard Sam Brinton share the lasting trauma from a doctor who used ice and hot coils to associate images of men with pain. We’ve heard Ryan Kendall testify about turning himself over to social services at 16 rather than be forced to continue the conversion therapy that was driving him to the brink of suicide. We’ve heard Deb Cuny recount the heartbreaking struggle to suppress her attraction to women by spending her teenage years being prayed over and even exorcised in an attempt to keep her family intact and fulfill her dream of becoming a minister. Those who traffic in these practices have now joined forces with anti-LGBT lawmakers and fringe organizations to defend them. We do not intend to let them win. For every Sam, or Ryan, or Deb, there are countless others who have endured this practice and live with the scars. They may survive and even thrive, but they never forget. And too many get lost along the way. Conversion therapy is a dangerous fraud. We intend to end it. 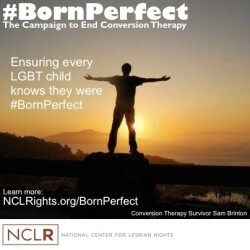 To join us, get the facts, and take action in your state, visit www.NCLRights.org/BornPerfect.